A burger and its girl. On Day 2 of our “Heartland America” tour – during our “States and Regions” Homeschool unit – we just happened to be passing through Kentucky. If you read part 1 of this series (and the few posts generously donated by friends while we were on our trip), you’ll have already seen the photos from early on in Day 2. Day 2 was our LONG drive. We were in the car for more than 18 hours – except for a few brief stops. 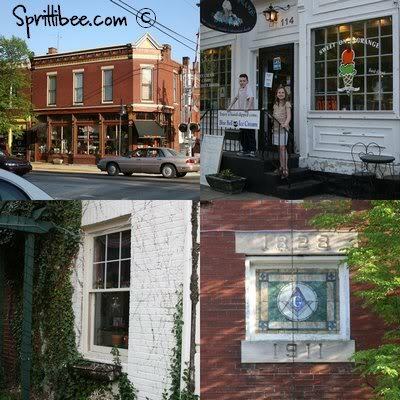 The most memorable stop on Day 2 was in La Grange, Kentucky. It even topped meeting a truckload of Mennonite women and children at McDonald’s and getting our photo taken with them (which I won’t be posting out of respect for them). Oldham County was established in 1824, and in 1827 La Grange became a city. The deed was presented by William Taylor, who named the city La Grange because his friend, the Marquis de Lafayette, had an estate in France by the same name, which means “the farm.” Before this, the site was call Crossroads, because it was situated on 5 major springs and had already become an established wagon path. La Grange is a song by ZZ Top. La Grange is a town in Texas – settled by Germans and Czechs – and is home to the Taco Bell Chihuahua. La Grange is a town in Tennessee with a population of under 200 that was nearly destroyed by Union Troops in the Civil War and never was able to return to its former size (once 3,000 citizens strong) or glory. La Grange is a town in Illinois… established in 1879 (named after the town in Tennessee). There’s also a La Grange in New York! La Grange was our dinner-time stop along our Heartland America Tour. A traveler is bound to get hungry, right? What better to do on a trip through unchartered territory than to stop in and try the local fare? When in Kentucky, do as Kentuckians do. 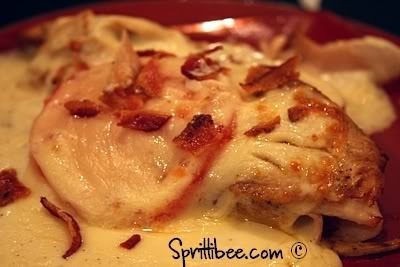 Eat a Kentucky Hot Brown. Lucky for us, another tourist on Main Street that had stopped to eat some ice cream told us about Norma Jean’s Trackside. They told us that the Kentucky Hot Brown was tasty there… so we set out down the street for a bite. Norma Jean’s was quite a step up from the sandwiches, snacks and fast food we had been enduring on the trip. It was time for a hot meal! 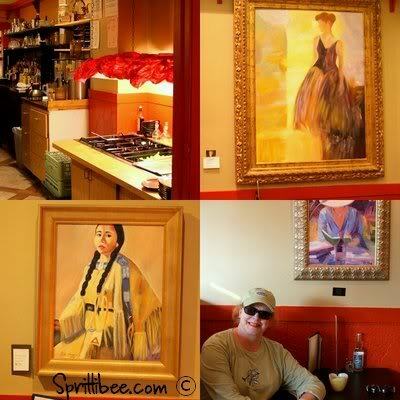 Inside the restaurant was covered with fine art. There was something beautiful to gaze at beside every table. Amazingly, the artist came in to eat while we were there and I was able to get a quick photo of her and many of her paintings. Norma Jean and her team posed for our camera, too – and tipped us off to the cheesecake. Our waitresses were awesome and the food HIT the SPOT! We were so stuffed after eating the amazing Kentucky Hot Brown that we had to take our cheesecake in a to-go box. Feast your eyes on this art! La Grange, Kentucky and Norma Jean’s Trackside are definitely worth a detour in my opinion. The kids enjoyed getting their photo taken with the restaurant owners outside and seeing the quaint Main Street market. Morgan opted for a burger, but did enjoy her bite of my “Brown”. Too bad Norma and her crew are in La Grange, Kentucky and not La Grange, Texas… because I doubt I’ll be able to go back for quite a long time. In the mean time, though – I hope that you’ll stop in and pay them all a visit if you are in the area or passing through. We drove off into the sunset with visions of antiques, ice-cream, toasted “Brown” cheese sauce, race horses, Teletubby Hills, and lovely old red barns in our heads. What nice memories of Kentucky to carry with us in to our ‘States & Regions‘ unit! There’s also a LaGrange, IN. Still missing you girl. 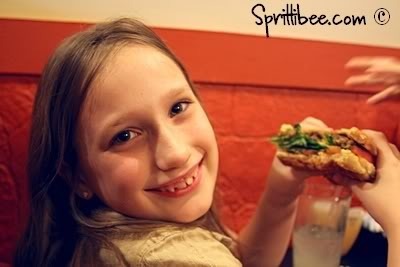 LOVE seeing that big burger smile on Morgan’s face! These pictures all look so familiar. You know, I still haven’t had time to blog about your stay 🙁 Can you send me some approved pictures maybe?! LOL Just kidding. Looking forward to more pics and more memories! boy, you’re really getting around! Looks like you guys are having a blast. How fun for your children to be able to travel like that! Beautiful pictures, Heather! I’m glad you made it there and back again safely. I’ll call you this weekend – my email is down temporarily for server maintenance – but I’m eager to get going on our co-op, if you are still up for it. Hi! 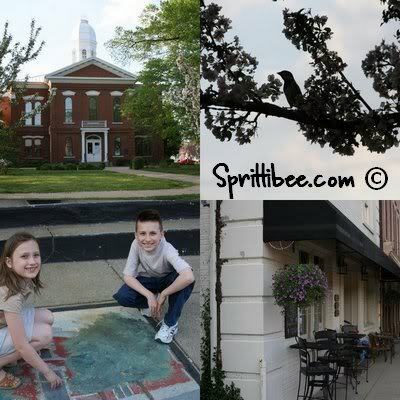 I’m a LaGrange resident and found your blog when I googled my town. My hubby and I grew up in Louisville suburbs and we moved out here 11 years ago with our 2 kids. (now grown but we HS for 4 years early on) We love LaGrange too and Norma Jean’s is our date night destination. The town square is filled with Farmer’s Market booths each Saturday throughout the summer. Next time you’re in town, stop and “set a spell”- there are wonderful things to see and educational stops in Louisville and KY. So glad you loved our little town! 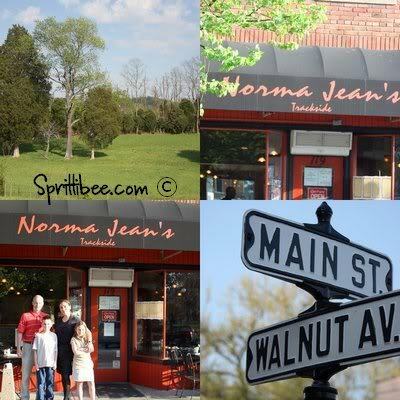 Thanks for the post about Norma Jean’s. This is Ned the goofy guy standing with his wife Sherri and our beautiful baby Emma. I am glad we had the pleasure of meeting you and you had a good experience. I hope the cheesecake was good. Heather — I’m catching up on all my friends in my google feed reader. I have to tell you how happy I am you got to travel through my home state! 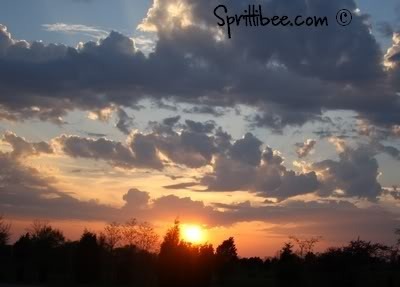 I love Kentucky and am always waiting patiently on God to send us back there after the Marine Corps if it’s His will. I just found your blog because I was searching Google for information on our local farmer’s market in LaGrange, Kentucky (our home). We homeschool as well and we truly enjoy living here. Glad to know you had a great time! Greetings from a homeschooler in La Grange!